I was spit on today (08-08-08). 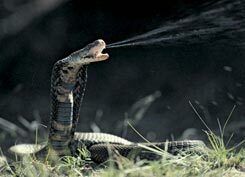 Never been spit on before .. certainly not in my face, nor with such venom (think » cobra). Surprised me more than anything. Someone would have to be pritty-mad to (even want to) spit in your face. Yes, I took a shower .. more however, to wash off the 'intangibles' than any salivary organics. The anger was palpable. (Literally.) And for no stated reason. Just a general-purpose spray-down .. at high-velocity. Tho I might've sensed a hint of frustration. Continue reading Spit in My Face.